How the Hell Did Three Pacific Reef Sharks Wind Up Off the Coast of Brazil? In today’s increasingly globalized and interconnected world, introductions of non-native species to new environments are common. 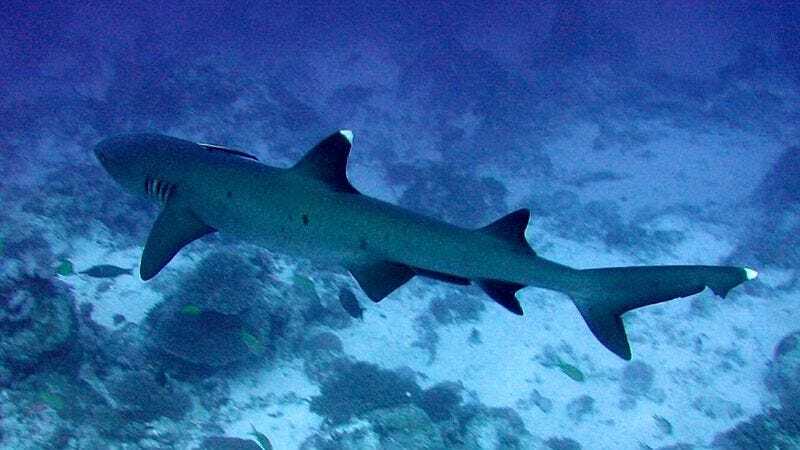 But even by modern standards, scientists are now reporting something truly bizarre: three whitetip reef sharks native to the Red Sea, Indian Ocean, and other parts of the Indo-Pacific recently appeared off the coast of Brazil. That’s according to a new study in the Journal of Fish Biology, which documents the first known instance of multiple individuals of a non-native shark species making it to a new environment. The observations, made by a Brazilian SCUBA diver in 2013 and published this month, are worrisome, seeing as non-native species often have no natural predators in their new environment to keep their numbers in check. If a non-native species is a predator, it can cause problems by both outcompeting native species for food, or by eating them. How did these sharks get all the way to the Atlantic Ocean? While whitetip reef sharks are a widespread species, they aren’t known for large-scale migrations like some larger sharks (a mystery that inspired recent global genetic research). The authors suggest that despite their famously sedentary behavior, these whitetip reef sharks might have just swum to Brazil! “This species could have dispersed in the Atlantic Ocean from the Indian Ocean by coming around the southern tip of Africa,” study lead author Hugo Bornatowski, professor at Center for Marine Studies of Federal University of Paraná, Brazil, told Earther. He pointed out a possible migration path through a network of currents called the Agulhas, Benguela, and Equatorial currents that go from the Indian to the Atlantic Ocean, noting that this exact route has been proposed to carry several non-native fish species. It’s more likely, however, that these sharks are in the waters off Brazil because humans put them there. Aquarium release is a common method by which non-native fish get introduced to new environments, and whitetip reef sharks are a common aquarium species. According to the new paper, only a few whitetip reef sharks have ever been exhibited in Brazil’s public aquariums to date. However, Bornatowski says that some Brazilians have kept these sharks in fish tanks in their homes, and people will often release a fish into the wild when it gets too large for a home tank. Whether these sharks got to Brazil via aquarium release, ocean-scale migration, or SharkNado, the fact remains that they may still be there now, and they might cause ecological problems. “Three adult sharks in a non-native environment have the potential to compete for food with other predators such as groupers and snappers and also to prey on native fishes and crustaceans,” said Bornatowski. He and his team hope to set up long-term scientific monitoring of these invaders. They have also advised that the Brazilian government review the list of species that can legally be imported into the country, and hope to educate home aquarists not to release non-native species.